THE SHOW INFORMATION LISTED BELOW IS "NOT VERIFIED!" AND HAS NOT BEEN CONFIRMED BY THE SHOW PROMOTER. WHILE WE BELIEVE THE INFORMATION BELOW WAS ACCURATE WHEN WE POSTED IT, SHOWS BELOW MAY HAVE BEEN CANCELLED WITHOUT NOTICE. Please tell them TexasGunShows.us is your preferred source for Texas Gun Show listings. Ask them to take advantage of our FREE gun show listings. Although we have tried to email all gun show promoters in the past, some have still not taken advantage of our FREE gun show listings, and don't always notify us of their show changes. Please ask them to work with us closer in the future. 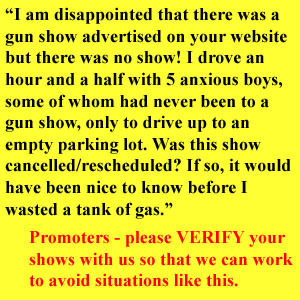 NOT VERIFIED is the marking we place when we are afraid a promoter may cancel their show without notice to us - and we would rather list it as NOT VERIFIED than have you drive to a show that isn't taking place. 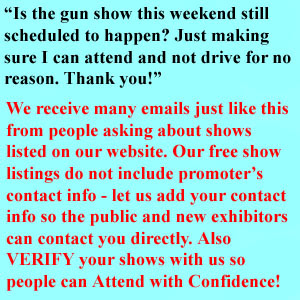 In an attempt to list as many gun shows as possible, we sometimes obtain show information from sources other than the promoter, we often add those shows but list them as NOT VERIFIED until we can get the promoter to visit our site and confirm we have their show information listed correctly. When we email promoters asking them to let us know if their shows are listed correctly - and they won't take the time to do that - we would rather leave those listings as NOT VERIFIED than risk the public driving to a show that has been CANCELLED WITHOUT NOTICE to us or our website visitors. WHEN A PROMOTER CANCELS SHOWS WITHOUT NOTIFYING US - WE TRY TO LIST THEIR THEIR UPCOMING SHOWS AS "NOT VERIFIED" UNTIL WE HAVE CONFIDENCE THEY WILL KEEP US NOTIFIED OF FUTURE SHOW CANCELLATIONS OR CHANGES. While shows marked as NOT VERIFIED may take place, we don't want to list them as verified because we are not confident that the promoter of that show will notify us if the show is rescheduled or cancelled - because they have not notified us of previously cancelled or rescheduled shows, have not taken time to let us know their shows are listed correctly here when we have periodically emailed to ask, or we have not been able to create a reliable working / communicating relationship with them. PROMOTERS: remember, we list basic show information for FREE, we only need you to let us know our listings are correct and that you will communicate with us about your shows as needed in the future - when you don't take the time to do that, we become concerned that you will cancel shows and not let us know - and we would rather list your show as NOT VERIFIED than have one of our site visitors drive to your show and find out it was cancelled and no one told us. We want to become partners with promoters and work together to try to make sure our website visitors have the most accurate and current listing of gun shows in their area. It costs nothing for a promoter to have their shows VERIFIED - they simply need to email us and be willing to work with us so we can keep you up-to-date on their show changes as soon as possible. We gather information from many sources in an attempt to provide you with listings of all upcoming gun shows - conveniently here at one place. Unfortunately, sometimes shows are cancelled or changed and the show promoter does not tell us about this. We encourage all show promoters to visit this website and make sure their shows are listed correctly - but some promoters don't take the time to do that. If you know a gun show promoter, please encourage them to participate in our VERIFIED GUN SHOW! program. Gun show promoters who participate in our VERIFIED GUN SHOW! program work closely with us to make sure the information listed about their shows here is correct, and they agree to notify us immediately with any show changes or cancellations. You can help us make this website better by asking gun show promoters to work with us to make sure we have their latest gun show information and also to notify us of any last minute changes so you don't waste time and money driving to a show that has been cancelled. The note to the right of this is something you can print and take to a gun show that does not participate in our VERIFIED GUN SHOW! program - tell them this matters to you and ask them to participate in the VERIFIED GUN SHOW! program. Click on the note on the right side of this screen and print and give it to a gun show promoter who has not verified their show here. Gun Show Attendees: Attend shows with confidence! If you have ever driven to a gun show - only to find out the show has been cancelled, rescheduled, or moved to another location - then you know why we created the VERIFIED GUN SHOW! program. Unfortunately billboard advertisements, newspaper ads and radio commercials often keep running even after a gun show has been cancelled or rescheduled. Many online websites also continue to list shows that have been rescheduled or cancelled. The VERIFIED GUN SHOW! program is different. First, gun show organizers and promoters who participate in the VERIFIED GUN SHOW! program check our listings of their shows to make sure the information given is accurate on our websites (many other websites don't do this). Secondly, and more important - VERIFIED GUN SHOW! participants are contacted by us just prior to their actual event taking place so that we can verify from them that the show is being setup and doors will open as advertised with us. Gun show attendees are encouraged to visit our site regularly to watch for shows scheduled for their area, and also check the site again the day before or day of the show to make sure the show is still taking place as planned. This saves gun show attendees time and gas, and allows you to make plans and attend shows with more confidence. VERIFIED GUN SHOW! websites are also mobile-friendly, perfect for checking while on the go! We also hope you will tell us know how to serve you, the gun buying public better. Your feedback, comments, and suggestions matter! Please scroll down to see a list of states we are currently serving, and watch for more states to be added in the future. Gun Show Exhibitors and Dealers: More Buyers! We know what it is like to setup at a poorly advertised show and later find out the public was confused by advertising or afraid the show might have been cancelled so decided to not show up at all. Dealers need customers to sell to, and our goal is to help with that. Support promoters who participate in our VERIFIED GUN SHOW! program - know they are trying to take extra steps to make sure their shows are advertised accurately and helping the public feel more confident about showing up. It is a team effort, and we hope you will let us know how we can serve you and your customers better. 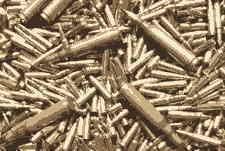 Gun Show Promoters and Organizers: Customer Satisfaction! We may be new to your state, but we are not new to the gun show industry. We began our first state-specific gun show website back in 2008 and it became a resource the public used to keep up with shows in that state, dealers used as a planner to decide which shows to setup at, and promoters used it as a way to know what other promoter's dates were so they could better plan future shows. Our VERIFIED GUN SHOW! program offers a way to promote your shows while also trying to better serve the needs of your attendees and vendors. Tell Gun Shows "YOU SAW THEM online at TexasGunShows.us!" whenever promoters ask, or whenever you contact a promoter who's shows are listed on our website. Tell your friends and others about this website and the VERIFIED GUN SHOW! program - the more people who know about us and visit our website the better. If a gun show promoter does not have their gun shows VERIFIED! through the VERIFIED GUN SHOW! program - please tell them it is important to you that they VERIFY their gun shows and work with us to make sure their gun show information is always accurate and up-to-date! Gun show dealers and exhibitors - this website, along with our other state specific websites, can help you decide which shows you will participate in during the year. Our goal is to provide and maintain an accurate, up-to-date listing of gun shows throughout each state. This is also a valuable tool for the public to use in deciding which gun shows to attend - their time is important and they want to attend a gun show with confidence - we help with that. 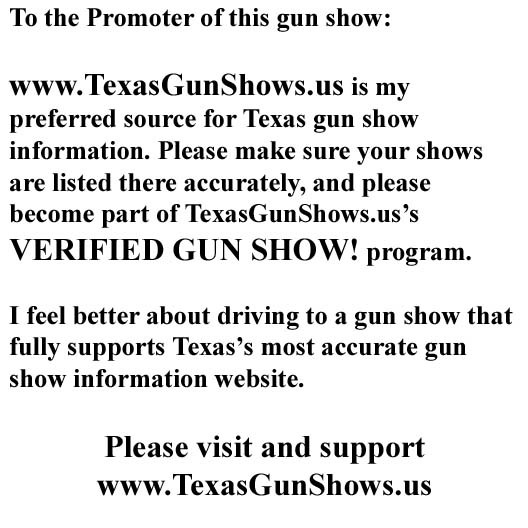 If you are aware of a gun show promoter who does not have their shows VERIFIED through the VERIFIED GUN SHOW! program at - please ask them to. If a promoter says they are doing saturation advertising and they don't participate in our program - they are not really doing saturation advertising and they are not trying to take care of their client's needs - the attending public and gun show exhibitors who come to our website looking for reassurance that a show is taking place.